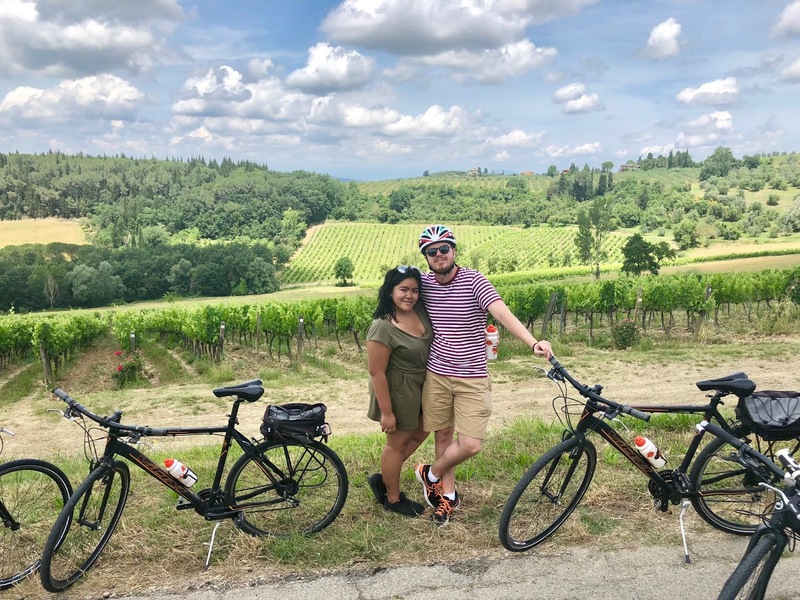 It was time to 'put the fun between our legs' and head out from the centre of Florence to the Tuscan countryside for a day on the bikes around what it such a beautiful region. 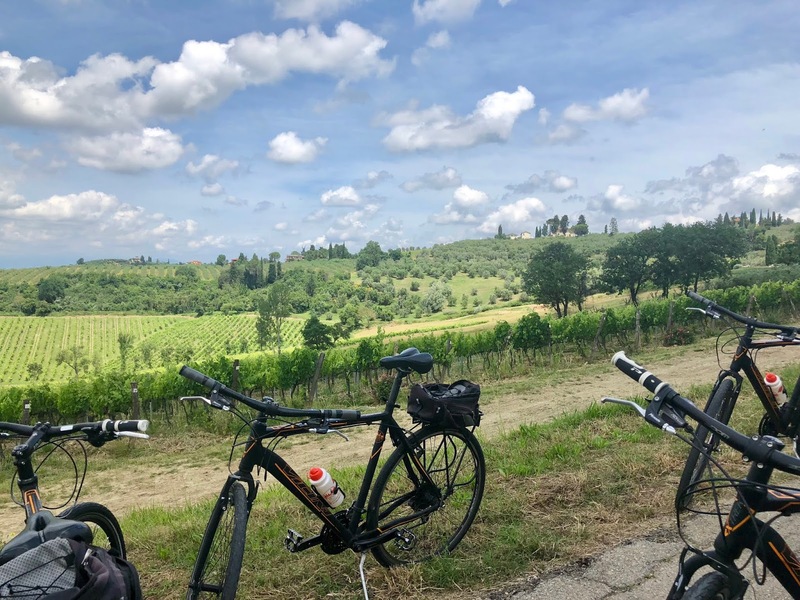 With Tuscany Bike Tours, we left their city centre office at 10am in their vans and with beautiful scenery and a great chat with one of the guides along the way, we arrived at a beautiful hilltop village less than one hour later. 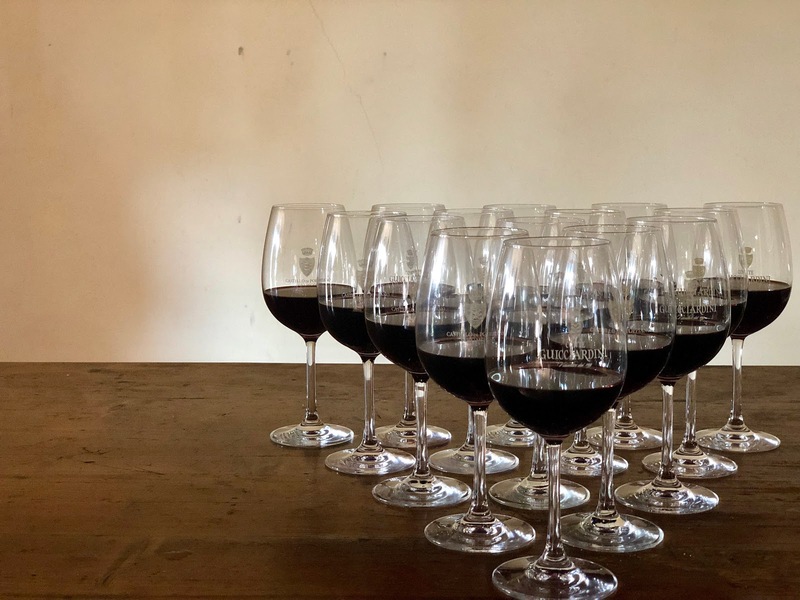 With being in one of the most famous wine regions of Italy, no tour here of any type even begins without a glass of Chianti red - so before we had even seen any bikes it was into a 12th century castle for a tasting of wine and olive oil which was produced right there on the family estate. 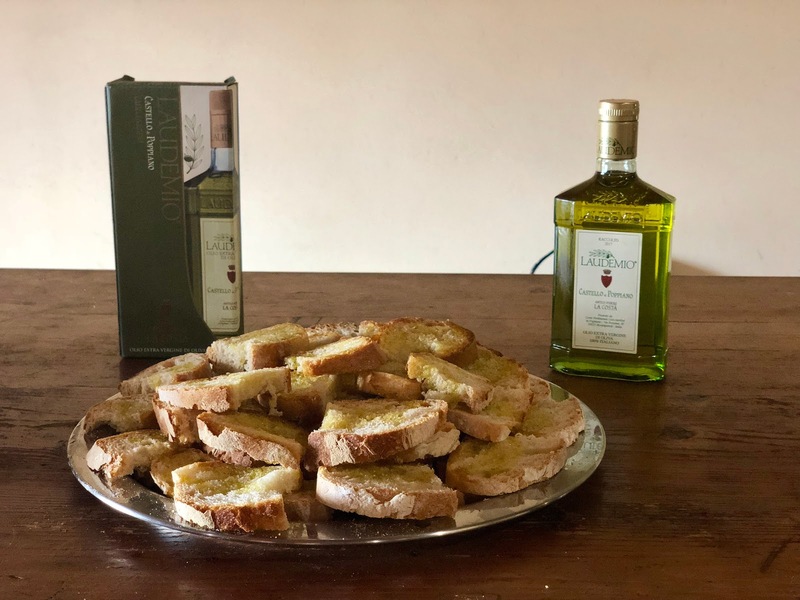 We walked through where the wine is aged and the olive oil production facility before climbing the tower of the castle for a jaw dropping panoramic of the area. The tranquility and beauty of it was amazing. Following that, the main event of getting on the bikes and the start of what was a total of 13 miles up and down the beautiful country hills. Unfortunately we thought our day may have ended very prematurely after the first leg. It was another incredibly hot day and the inclines were too much for Jessica. I carried on all the way through, however it wasn't the bike ride, history lessons or food that spoke most volumes most about this fantastic company - it was the way the dealt with Jessica and a few others who couldn't take it the whole way through. 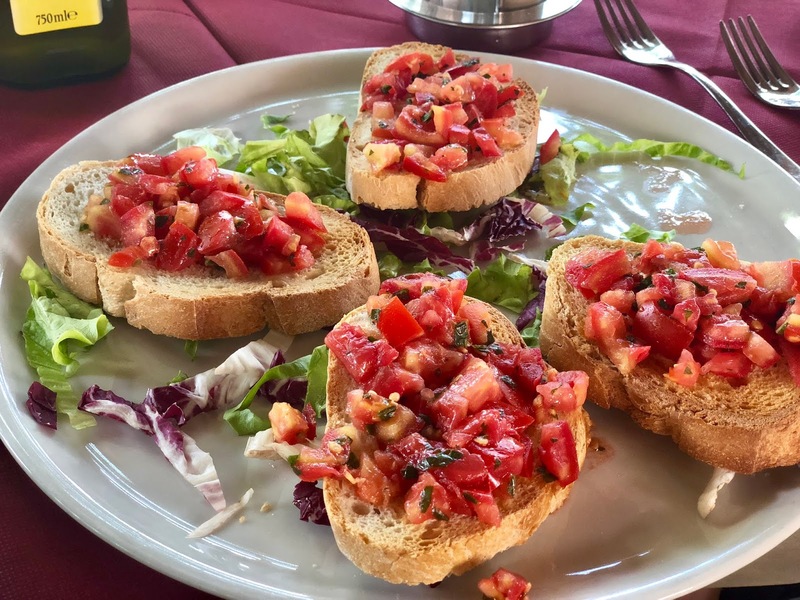 After an hour or so's more riding we stopped for lunch at a family run restaurant where we were treated to mixed salad, breads, bruschetta, pasta, a chocolate dessert and coffee. The food was sublime and we definitely needed the carbs for a long afternoon on the bikes which lay ahead of us. All of this was included in the price of the tour which at 85 euros per person, is fantastic. Jessica rejoined the cyclists for the afternoon session and we got well on our way to more mixed terrains and breathtaking views across the landscape. One of the last sections was by far the toughest and steepest we had seen all day. I can't remember the % grade of the road I attempted to get up, but I only got half way before my legs couldn't take it anymore. Feeling a little bit gutted, I jumped in the van for the other half. Ending our day where we started it at the castle for our trip to Florence made us realise how tired the day had made us. This was right up their with one of our favourite days of the trip and we couldn't recommend it enough. It was so hard but I'm so happy they had a support an because I wouldn't have know what to do! Oh wow that sounds like an incredible experience! That is so lovely that they really care about those doing their tours and have the bus alongside the bikes, I know I couldn’t have managed to cycle the whole thing! 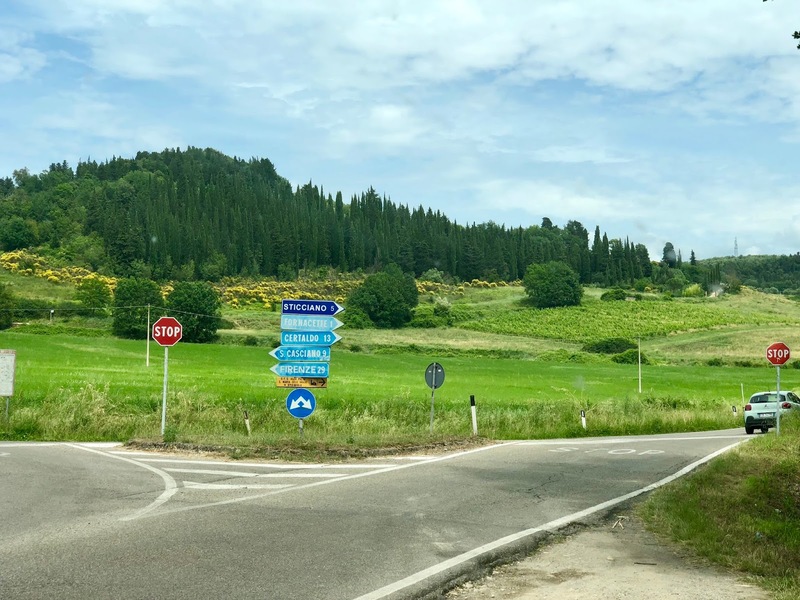 That sounds like an amazing way to see more of Italy! It was actually so hard but James did 90% of it and I applaud those who did it all, especially the hardest stretch! Wow, it sounds like you had such an amazing experience! I'd love to do something like that in the future, I don't think I would be able to bike the whole way though haha, it's a great that they have the support van to follow, help out and provide water etc. It's great also that they care too! Your photos are incredible, and that food looks delicious! I think that's what I appreciate that most, that they had so much support to give and gave us the opportunity to stop and go at each section! The scenery was much worth the ride! Although it was tough, it was definitely so much fun! Great achievement! This sounds like such an incredible experience! It’s great they had a support van too so at no point people missed out and it was their to help/ provide water! Looks like you had an amazing time, your photos are beautiful too, makes me want to do a tour like this! It was so incredible, would defo do it again in a heart beat! Biking and wine(ing) what a lovely combo! This goes in my travel bucket list! Haha yes, the food and wine made it all that much worth it! A 13 mile bike ride sounds like an absolute dream with those views! That’s great that there was a support van following closely in case the distance was too much for people. It sounds like an amazing experience!